This picture is a single pole 15 amp GE afci breaker with a single pole 15 amp standard breaker connected with a handle tie. Is this ok? It feeds a multiwire circuit. Other problems with this service are double grounded conductors under one terminal, grounded and grounding conductors under one terminal, other manufacturers breakers not isted for the panel, and the 15 of unfused SE cable in the picture on another thread. Sorry for the fuzzy picture. I have more than a little concern as to the overalll competence of whoever did this work. The handle tie, while not in itself a violation, defies logic. As with GFI breakers, you can't share a neutral between circuits- so this cannot be for a multi-wire branch circuit. So the big question is: WHY? As for the multiple conductors under one screw, you can probable sort the mess out by grouping the grounds - as many as three are permitted (per UL white book). An easy fix. A lot of people have a misunderstanding of where handle ties are required. For example, I had an electrician insist that handle ties were required when more than one circuit was in a box! I'll bet this was the case here. I have no problem with the installation. Doug: Under the 2002, handle ties needed only be "approved". It wasn't until the 2005 that handle ties were required to be "identified". This feeds a multiwire circuit. 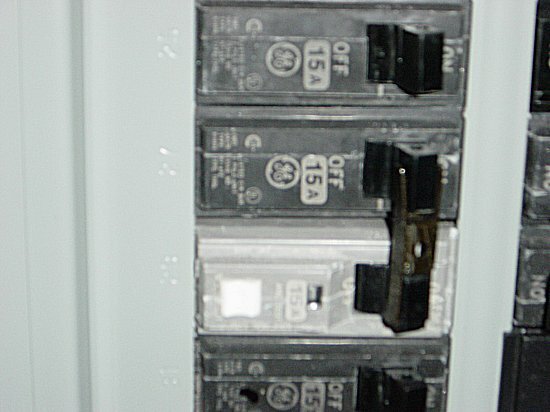 The neutral is connected to the afci breaker. It just seems wrong. why it was done I don't know. This was a service upgrade?? If it was installed in the beginning of 02, The MEC originally required AFCI on panel changes. That was rescinded in May of 02, but there was only a mailing to the inspectors. Lack of funding. If the time line seems right! this could have been a feeble attempt to address the AFCI issue. Not a very good attempt but that might be the motivation! Charlie this is the panel from the other pitcture I posted regarding the SE cable. It was installed last fall as part of a renovation and addition. The house had a bedroom added. I have no idea why this needed a two pole breaker. From what I saw it is a multiwire circuit feedeing some things in the new bedroom and an office. From the work that I saw there I think the electrician is not educated as to when handle ties are needed, among many other things. Ryan - wasn't sure of the date on the "approval" language, but I'd seen pics of some rather imaginative ties on Joe T's website, and remembered some of the discussion. Missed the one breaker being AFCI... sorry.